Without public disclosure, Chevron has re-upped its contract to pay $144,000 annually to former Ecuadorian judge Alberto Guerra after he admitted perjuring himself in a federal court during the company's RICO trial. The perjury happened after Chevron lawyers at the outside law firm Gibson Dunn coached Guerra on his false testimony for 53 consecutive days. We have no choice but to call this what it is: a witness bribery scheme orchestrated by a major American oil company. Chevron's aim is to evade paying for the clean-up of what could be the world's worst oil disaster, caused deliberately on its watch when it operated in Ecuador (under the Texaco brand) from 1964 to 1992. The discredited Guerra – who has admitted that he accepted bribes when he was a judge in Ecuador – has become a central figure in Chevron's campaign to evade paying the $9.5 billion environmental judgment in the South American nation. Chevron was found to have deliberately dumped billions of gallons of toxic waste into the streams and rivers of the rainforest. The dumping continues to decimate indigenous groups and has caused an outbreak of cancer, according to the findings of three layers of courts in Chevron's preferred forum of Ecuador. The Chevron payments to Guerra seem to have earned the company and its ethically-challenged lawyers at Gibson Dunn a fraud and bribery complaint to the U.S. Department of Justice. Amazon Watch, an environmental group that has been fighting to hold Chevron accountable, said it will lodge a formal complaint over the witness payments and falsification of evidence. It is unethical, illegal, and utterly shocking that Chevron continues to pay huge sums to a completely discredited witness who has admitted to repeatedly lying and accepting bribes to testify falsely in court. This arrangement is worthy of a criminal investigation and we are asking the Department of Justice to look into it. We consider Chevron to have engaged in witness bribery. Chevron and its lawyers gave a key witness cash out of a suitcase to falsify evidence to taint the Ecuador judgment so the company does not have to pay for the clean-up of oil pollution that is causing grave harm to thousands of people. This is just one example of the company's plan to threaten judges and sabotage the proceedings in Ecuador. Guerra stunned the legal community after he admitted during a recent international arbitration proceeding that he lied on the stand during the company's retaliatory civil "racketeering" (or RICO) case targeting the lawyers for the villagers who won the historic judgment. Chevron made a mockery of justice in that case after the judge (Lewis A. Kaplan) displayed intense personal animus toward the villagers while hiding his investments in Chevron despite calls for his recusal over bias. Guerra also recanted key portions of his testimony in the RICO case claiming that the Ecuadorian trial judgment was ghostwritten by the plaintiffs, according to reports from Courthouse News and Vice. These developments emerged recently when transcripts from the arbitration finally were released after Chevron, in yet another violation of the ethical rules, tried to keep them under wraps for months. The transcripts show Guerra admitting that Chevron extended his contract for another year. 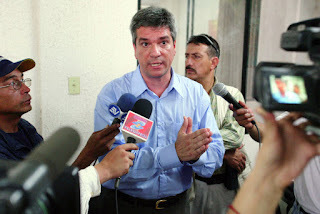 Guerra does no work for Chevron other than make himself available to testify on the Ecuador case – a fact that many observers believe violates federal law and the ethical rules, as this legal brief and this opinion from a prominent ethics expert explain. Yet Chevron continues to make up its own rules. In 2012, company operatives Andres Rivero and Yohi Ackerman traveled to Ecuador and paid Guerra $38,000 in cash out of a suitcase for his "cooperation" with the company. That included a promise by Guerra to try to bribe the trial judge with a down payment of $1 million with the goal of getting him to recant his decision. "Money talks but gold screams," Guerra said to the Chevron operatives at the time. Chevron then inked a two-year deal providing Guerra a $144,000 annual salary, full payment of all income taxes, payment for the fees of three personal lawyers, health care, a car, and immigration services. The immigration services have allowed several family members to become residents of the United States after some had been living here illegally for years. We also believe that Guerra and his team lied to the Department of Homeland Security to legalize the status of himself and his family members. By not disclosing to the U.S. government the many crimes Guerra had committed in Ecuador and later in the United States, Guerra (and Chevron) arguably violated U.S. law and committed a felony. Our investigation of this aspect of the Chevron-Guerra subterfuge continues. All told, we conservatively estimate Chevron's paid benefits to Guerra amount to at least $250,000 annually. The amount rises considerably when one takes into account benefits paid to Guerra's three adult children and their families. Not bad for a man who testified he had $146 in his bank account when he struck the deal with Chevron. Chevron lawyers Randy Mastro and Avi Weitzman coached Guerra for several weeks before letting him testify. Guerra had been removed from the bench in Ecuador for misconduct and was facing criminal prosecution until Chevron agents spirited him out of the country. Mastro also personally negotiated Chevron's payments to Guerra at precisely the same time his team was drafting a sworn affidavit for Guerra to sign that by Guerra's own admissions contained multiple lies. Guerra admitted in the arbitration that he lied when he told Judge Kaplan he had been offered a "bribe" from the plaintiffs to write the trial court judgment against Chevron. He also confessed that critically important shipping records had nothing to do with the Chevron case, contradicting his prior testimony. He confessed that there were no emails or documentary evidence that the trial court judgment had been drafted by the plaintiffs and then given to the judge on a flash drive, as he had told Judge Kaplan. The entire saga might expose Mastro and Weitzman to criminal prosecution, according to respected environmental lawyer Marco Simons. One of the main targets of Chevron's retaliation campaign, U.S. attorney Steven Donziger, has filed the latest evidence of Guerra's collapse before the federal appellate panel reviewing Judge Kaplan's flawed decision. Donziger also turned the tables on Chevron by demanding the company cease the destruction of all documents related to the dispute in anticipation of further litigation by the villagers over the company's worsening misconduct. The more Chevron fights, the more the company and General Counsel Pate seem to lose ground. Chevron's jurisdictional shell game is getting more exposed. The larger question is when Chevron's top leaders will be held accountable for the destruction of the Amazon and their own gross misconduct in evading court orders to clean up the damage. It is widely known that Chevron has acted as a serial forum shopper when it comes to trying to evade its liability for creating an environmental disaster in Ecuador's Amazon. But Chevron's game of corporate subterfuge and litigation is clearly unraveling, spelling huge new risks for company shareholders. In short, Chevron CEO John Watson's billion-dollar campaign to buy impunity for Chevron's human rights abuses in Ecuador is flaming out. Watson himself is at risk of being whipsawed by his own short-sightedness. Ecuador's Supreme Court already ruled in 2013 that Chevron must pay up. True to form, Watson had sold off company assets in Ecuador as the evidence proving the company's pollution poured in to court. Watson's posture of evasion not only has infuriated Chevron shareholders and alienated environmental and human rights groups, but has forced the impoverished villagers to chase down company assets around the world in a cynical game of corporate hide and seek. Through their own behaviour and legal non-compliance, they have made themselves the subject of outstanding obligations, so they must be called upon to answer for their debts in various jurisdictions... The need to acknowledge and show respect for the legal action of other states has consistently remained one of comity's core components, and militates in favor of recognition and enforcement. Chevron some time ago declared a total war, scorched earth legal strategy against this claim by the Ecuadorian villagers, and in this proceeding in Canada, Chevron was seeking to import into the law of international reciprocal enforcement of judgments an entirely novel test... in its decision the Supreme Court methodically and meticulously analyzed, and rejected, that attempt, based on existing legal principles -- and rightly so. Chevron's forum shopping has been well-documented. Chevron blocked the original case from being heard in U.S. courts (where it was filed in 1993) and insisted the litigation take place in Ecuador. It filed 14 sworn affidavits praising the fairness of Ecuador's courts. Once in Ecuador, Chevron sold off its assets in the country and tried to get the matter dismissed on jurisdictional grounds even though it had promised U.S. courts it would accept jurisdiction there. When that didn't work, it started to attack the very courts it had previously praised. After years of trying to sabotage the proceedings in Ecuador -- Chevron's lawyers threatened judges with jail time and filed thousands of frivolous motions -- the courts ruled against the company based on more than 100 technical evidentiary reports and the company's own internal environmental audits. Despite its earlier promises, Chevron refused to pay and said it would fight the matter "until hell freezes over and then fight it out on the ice." In Canada, Chevron tried to block the enforcement action by claiming its assets are held by a wholly-owned subsidiary. In Argentina, where another enforcement action was filed, Watson flew to Buenos Aries and met with the country's President. He then invested in a new gas field in exchange for a technical dismissal of the enforcement action. Back in the United States, Chevron convinced a rogue federal trial judge in Manhattan to issue an unprecedented and illegal order purporting to block the villagers from attempting to enforce their judgment anywhere in the world. The judge, who had undisclosed investments in Chevron when he ruled, was reversed unanimously on appeal. He was also mocked by international law scholars around the world. Chevron will face major hurdles in Canada if it tries to allege it was the victim of "fraud" by the very people it poisoned in Ecuador. Its evidence in this regard was rejected unanimously by Ecuador's Supreme Court and has been debunked even more since in other legal proceedings. The real fraud is how Chevron uses its fake allegation to retaliate against those who held it accountable. Chevron's two decades of litigation trickery, executed by no fewer than 60 different law firms paid enormous sums by the company, has forestalled justice in Ecuador for far too long. Something tells us the respected courts of Canada understand this point very well.